.. after the cemetery restoration project was completed. Looking south-south-east. The two stones to the right are the modern Revolutionary War memorial monuments for Capt. Nathan Rose (forefront) and Lt. Thomas Rose. Looking south-south-east. The two stones just visible in the center of the picture are the modern Revolutionary War memorial monuments for Capt. Nathan Rose (forefront) and Lt. Thomas Rose. .. looking NNE. Believed to have been taken about 1981 when the cemetery plot was in the middle of a farm field. .. looking northeast. Believed to have been taken about 1981 when the cemetery was in the middle of a farm field. .. believed to have been taken about 1981 when the Rose Family cemetery was in the middle of a farm field. In this picture, students are at the same location as #30.00.5, above. A monument was uncovered near to the location, of the same general shape as the stone to the right in the 1981 picture. It was of Phebe Desire Rose. There were, however, many fragments of broken monuments. A gravestone consistent with the shape of the stone to the left in the 1981 picture was not found and may be permanently lost. .. members of the Fire Place History Club examine excavated gravestone in preparation for the club's Conservation and restoration program at the Rose Family Cemetery, 3 April 2008. .. representatives of the Brookhaven Village Association, Post Morrow Foundation, Fireplace History Club and neighbors look on as Hollis Warner, proprietor of the Peconic Monument Works, Riverhead, NY examines gravestones in the Rose cemetery in preparation to their restoration or conservation. ... Ben Savage, Ron Kinsella, Eben Ludlow and John Deitz are laying out grid lines preliminary to documenting monument locations. ... as an activity of the 2008 restoration project, a grid of 10 ft x 10 ft squares was laid out. The location of each head and foot stone was documented with measurements to the grid lines and photographs. In order for repairs to be made, some stones were removed and taken to the stone mason's shop. To the best as can be determined at the time, they were reset to what were believed to have been their original locations. The Rose Cemetery is located off Jared Path in the Hamlet of Brookhaven, in what was once farmland but has recently become part of a new development. The cemetery's dimensions are approximately 53 feet east-west and 125 feet north-south. Thomas Rose, a weaver and farmer, is reputed to be the first permanent Anglo settler on Fire Place Neck. Records of the Town of Brookhaven record that on Oct. 12, 1700 Thomas Rose recorded an earmark for his cattle, indicating that he had a farm here on Fire Place Neck. In 1704 he purchased Lot 25 from Richard Floyd and Lot 26 from Benjamin Smith. With his son Nathan, they continued to acquired tracts of land along Beaverdam Road on both the north and south sides. By the end of the 18th century, the family was perhaps the largest single landowners on Fire Place Neck. Monuments for four generations of the Rose family and in-laws may be found in this cemetery — starting at the grandchildren of Thomas (the weaver). Neither Thomas Rose nor his son Nathan have monuments in this cemetery, and monuments elsewhere have not been found. I think it likely that they were originally buried in this cemetery, but that their memorial stones are no longer extant. It is arguably the most important historical cemetery in Brookhaven Hamlet. During the 1950s, Richard Beyer as a youth living in Brookhaven Hamlet, discovered and visited the Rose Family Cemetery many times. Years later he wrote this sonnet. reverberates the mariner’s last lay. now anchored here obscure from lasting fame. the “All Hands Lost At Sea,” now half erased. In the early 19th century, the Rose family began to sell their holdings, and by the end of the century much of their original lands were no longer in the Rose family. A major tract, on both sides of Beaverdam Rd., was sold about 1830-1840 to John L. Ireland (1796-1879), a wealthy New Yorker with land interests in Greenwich Village and Upstate New York. This sale was attributed to William Rose (1807-1847), grandson of the Lt. Thomas Rose buried in the Rose Cemetery. While I have not determined the precise boundaries of this purchase, it seems to have included most of the farmland east of Bay Road to at least Mott Lane, and from Beaverdam Rd. to the Bay (see maps 1873 and 1888). It also included some tracts north of Beaver Dam Rd., including the "Senator" John Rose Homestead just to the west of Beaver Dam Creek (although Rose family members continued to live there until the early 20th century). The Ireland estate therefore encompassed the old family cemetery. The Ireland's occupied this estate until after John L.'s death. His wife, Mary Gelston Floyd, was a granddaughter of William Floyd of Mastic Neck and a signer of the Declaration of Independence. The Irelands appear to have been active in the affairs of the local community. While both John L. and Mary were Presbyterian, they deeded the land for St. James Episcopal Church in 1872. 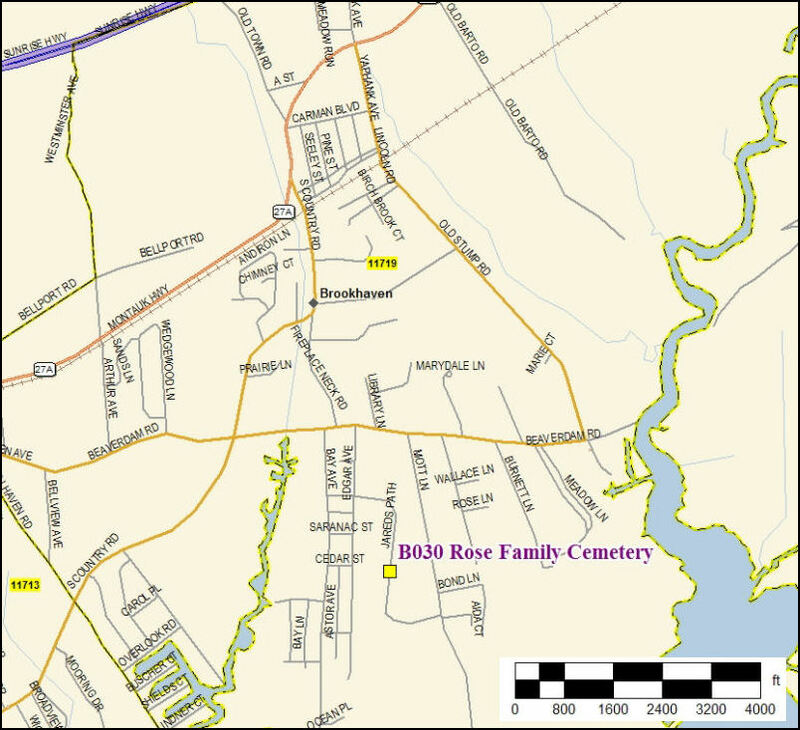 Another Rose family cemetery (B052) also existed in Fire Place, approximately where the Brookhaven Free Library now sits. This "new" Rose family cemetery was apparently established after the Ireland's purchased the lands surrounding the old Rose cemetery. However, some Rose family burials continued at the old cemetery, the last being of Hannah Cobb Rose in 1855, long after the surrounding lands had been sold to John Ireland. It is in the "new" Rose cemetery that "Senator" John Rose, a son of Lt. Thomas of this cemetery, and other family members of later generations were buried. Sometime shortly after 1890, the memorial stones, and likely the graves, from the "new" Rose cemetery were moved to the then newly established Oaklawn Cemetery (B021) in Brookhaven Hamlet. By the 1930's there had been serious deterioration of this Rose Cemetery. In a 1933 talk given by then Brookhaven Town Historian Osborne Shaw at the Brookhaven Free Library, Shaw complained that our Revolutionary War veterans, Lt. Thomas Rose and Capt. Nathan Rose, and their families, "lie buried in the shameful and unkempt little burying ground . . . a disgrace your Village Improvement Association should remedy" (see Osborne Shaw's Comments, 1933) . However, neglect by the Town of Brookhaven, ill-defined boundaries in the middle of farm land, and destructive farmer intrusions, lead to its further deterioration. In 1980, the Williams and Sack families cleaned up the cemetery and installed a split rail fence around it. By that time however, most of the stones had fallen, were broken and partially buried. In 1981, through community action, modern monuments were erected for the two Revolutionary War soldiers buried there — the brothers Capt. Nathan and Lt. Thomas Rose. The Fire Place History Club, a group of Brookhaven and South Haven hamlet residents interested in local history, decided in the Fall of 2007 to make this cemetery their highest priority for conservation. During 2008, members of the Club excavated, laid out and inventoried the headstones. They then hired a professional stone mason — Peconic Monument Works of Riverhead, NY — to repair and set them. Thanks to financial support from about 50 people in the community and the Brookhaven Village Association, over $2,800 was raised for the project, headed by Martin Van Lith, Brookhaven Village Association Historian. In August 2008, the restoration project was completed. A total of twenty-three headstones were identified, many of which had fallen or were broken. Fourteen headstones required repaired, some extensive. Two headstones were beyond repair; on recommendation of the stone mason, these headstones were laid flat in a bed of gravel to discourage weed growth, and provide drainage — hopefully minimizing further deterioration. Two headstones known to have existed in the 1930's were not found. One — that of Phebe, wife of Major Timothy Rose — and is likely the indecipherable rubble pile found nearby to Major Timothy Rose's headstone; a nearby unidentifiedable headstone stump was the likely the location of her headstone. No evidence was found of the other — that of Timothy Rose, son of William Rose. One new headstone not previously identified on any known inventory was discovered — that of Charles B. Hallock. Also discovered were several apparently scattered footstones, of which two could not be associated with any know headstones; additional headstones may therefore lay buried and undiscovered.. The approximate original locations of the footstones are documented on the site grid map (box, right). Those that were capable of being associated with a headstone were reset at the headstone location. The two that could not be associated with a headstone were set at the south end of the site; however, it should be understood that these new locations in no way are indicative of possible original headstone sites. Also scattered throughout the site were many stone fragments which have been gathered and efforts are continuing to place these together with missing stone pieces. A review of the damage to the stones suggests that it was probably by two different mechanisms. Some of it appears to have been from farm equipment hitting and knocking stones over. This abuse, while serious, may not have been malicious, just negligence — giving the benefit of doubt. However, the stone mason suggested that the nature of the damage to others was more likely intentional and malicious. The nature of the cracks, and blow-out fragments from the back of the stones, indicates that they were smashed by a heavy sledge hammer or similar instrument. A major reason for the damage is long standing negligence by the Town of Brookhaven. Under New York State law, since at least the late 19th century, the Town of Brookhaven is under a duty to care for abandoned cemeteries and burying grounds located in the town. As a minimum, the law requires fencing of the cemetery to prevent adjacent property owners intrusion, and periodic mowing (normally three time a year) to prevent the cemetery from becoming overgrown. Rights of way are to be established to the cemetery. For more information, visit the BrookhavenSouthHaven .org cemeteries page. This cemetery has Historic Sites Ref. ID Br33, is #30 on the Town of Brookhaven Historian's Cemetery Inventory, and has Suffolk County Tax Map reference 200-978.50-01-01.55. Its global coordinates are approximately Latitude N40° 46.040' Longitude W72° 54.626'. Its Town of Brookhaven Parks and Recreation inventory ID is believed to be 4378. Since some of the headstones are difficult to read, the following list includes information from the Town of Brookhaven Historians Cemetery Inventory, mostly compiled/published in 1939. The original listing did not include full tombstone transcriptions. The version in my possession included supplemental notations in an unknown hand; I have used these notations to help confirm ambiguous relationships. Another useful source has been photocopies of the entries in the Ketcham family bible, now in possession of a descendent of Scudder Ketcham. He was a son of Scudder Ketcham and Elizabeth Rose, and grandson of Captain Nathan Rose. Oliver was a son of Scudder Ketcham and Elizabeth Rose, and a grandson of Captain Nathan Rose. On the gravestone also can be found an inscription for his brother, Timothy Ketcham (#30.01.1.2), with a death date of 19 Sep 1819. He also died from drowning. Timothy also has a seperate monument. She was a daughter of Timothy Major and Phebe Rose. Taken in 2002, before the cemetery restoration project. He was a son of Capt. Nathan Rose. She was the wife of Major Timothy Rose, and daughter-in-law of Capt. Nathan Rose. This gravestone could not be found in 2002. She was wife of Joseph Rose. .. following its 2008 restoration. She was the infant daughter of William Brewster Rose and Parnal Reeve, and granddaughter of Joseph Rose and Hannah Cobb. She was a daughter of William Brewster Rose and Parnal Reeve. .. following it's 2008 restoration.